The Division of Security investigates complaints received regarding the integrity of the Florida Lottery. The Division of Security also conducts operations to ensure Lottery retailers are properly handling, paying and instructing players on winning/non-winning tickets. Lottery retailers who are found to be involved in criminal activity, including deceiving Florida Lottery players have been arrested and prosecuted along with their retailer contracts being suspended and/or terminated. 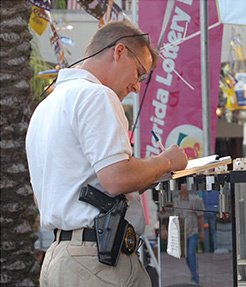 Lottery Special Agents also offer unique assistance to other law enforcement agencies throughout the state such as providing information regarding attempts to cash stolen Florida Lottery tickets which may lead to locating suspects and key witnesses in ongoing investigations. Special Agents are also able to assist in providing leads in investigations when Florida Lottery tickets were present at a crime scene (i.e., assisting with the re-creation of a timeline, identifying the retailer that sold the ticket, etc. ); provide forensic analysis of Florida Lottery tickets; initiate administrative cases against a retailer for major law violations (i.e., drug-related, stolen property, theft, money laundering, gambling, etc.) which may result in the suspension or termination of a Florida Lottery retailer contract; provide information and materials on lottery scams, theft of Florida Lottery tickets, or other lottery crimes; and provide testimony and evidence in court cases involving Florida Lottery tickets and operations.